Transparency popped up as sheer panels and cutouts with looks that ran the gamut from sporty to dressy. Transparency added an edge to Lucite soles and transparent straps on sandals as well as handbags. High contrast in stripes, polka dots, color blocking, and graphics highlight the dramatic appeal of black and white. The combination seems fresh for spring and an antidote to the riot of colors and prints. Far from demure, colored lace is a strong fashion statement for spring. Some dresses featured the ornateness of guipere lace, while others were more delicate and flowing. The ease of a kimono wrap jacket inspired various crossover styles, evocative of the east. A carryover from last spring, prints on skinny jeans inject some pattern and color to your denim collection, with some jeans dressy enough for an evening out. Color is always a welcome sign of spring and this season, blues in hues from aqua to deep cobalt and navy abound. The fit is easy as well as tailored and the prints myriad in patterned trousers, another carryover from past seasons. With a bit of 60’ s appeal, the stack heeled sandal with a strap is an updated and comfortable alternative to platforms and wedges. Ruffles meander across collarbones and limbs and become more sculptural than frilly, while some peplums become ruffles. Dressier than a cardigan but less formal than a jacket, the sleeveless blazer is a perfect finishing piece for many a spring outfit. Enjoy carryovers from past seasons, such as printed jeans, peplums, and the color orange, which has practically become a neutral. Denim is always strong, with the revival of distressed jeans and denim jackets. Have fun with so many choices for the new spring season. The Oscars and the Red Carpet provide us mere mortals with a chance to be awed by celebrities and their gowns. Here are some that were personal favorites. Jessica Chastain channeled Old Hollywood glamour in an Armani Privee gown that fit her like a glove. The color, copper, under pink beads, with the wavy hairdo were all perfect choices. Charlize Theron was stunning in the simplicity of a white Dior Haute Couture gown with beaded peplum. It recalled my favorite gown from last year’s Red Carpet, a white Tom Ford gown and cape worn by Gwyneth Paltrow. Jennifer Anniston’s choice was not risky but decidedly classic. Who wouldn’t love a sumptuous red Valentino on the Red Carpet, especially when accessorized with Justin Theroux? Speaking of beautiful couples, George Clooney, ever debonair, still managed to shine next to Stacy Keibler’s metallic gown by Naem Khan. How can Jane Fonda possibly be 75? She was a standout in this yellow Versace. Though I find the styling a bit severe, she shows us how to dress age appropriate. Another lesson in age appropriate dressing was Sally Field in a red Valentino– a bit more flowy and feminine than Jane Fonda’s choice. Note both women’s choice to cover their arms, while still looking stylish and far from matronly. 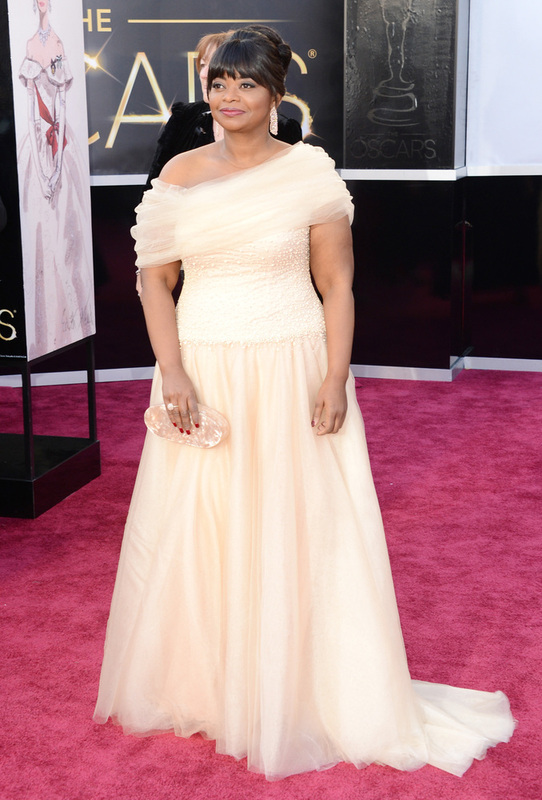 Octavia Spencer in Tadashi Shoji reminds us that women who are not size 2 can still amaze. I loved the tulle draping over her shoulders and arms and the beading on the bodice, along with her choice of a light peach color rather than black. Amy Adams looked like a princess in Oscar de la Renta. The grey blue color saved the gown from looking too much like meringue, as did the imperfectly ragged edged ruffles. Jennifer Lawrence’s choice of a pale pink Dior Haute Couture gown made her look like a winner on the Red Carpet before the Oscar for Best Actress! She wore a long necklace backwards, probably setting off a new trend. Amanda Seyfried’s halter neckline in an Alexander McQueen was a refreshing change from all the strapless gowns. The pale lavender color and embroidery made her glow. Some celebrities chose metallic gowns. Naomi Watts was in Armani Privee. While I wasn’t wild about the style of the gown, reminding me a bit of armor, she looked stunning. Nicole Kidman chose a L’Wren Scott, a simpler style with ornate hemline. Halle Berry was in Atelier Versace that recalled the 80s with the sharp shoulder pads while also looking Art Deco. It was a bit too extreme for my taste, but Halle Berry looks gorgeous in anything.